celebrate the 10th anniversary of the game. Enjoy! Majora’s Mask stands as an example of what the Zelda team is capable of producing when freed from the pressures and expectations that usually shadow the development of a Nintendo console’s first Zelda. The same team had previously brought us such classics as the original Legend of Zelda, A Link to the Past and Ocarina of Time, all first Zelda’s to appear on their respective consoles. Now that the original Zelda team was, for the first time, relieved from the immense pressure of creating the definitive adventure game for the latest console generation, they could finally give us a glimpse of a different type of Zelda, never before seen or heard. Everything about Majora’s Mask is drastically different from the previous installments. We get a taste of a darker, almost melancholic atmosphere that set a very unique tone to the game. A huge contributor to the game’s quirky atmosphere was its soundtrack that stands out as a very exceptional piece of Zelda music. It is also a very peculiar score for Nintendo’s lead musician Koji Kondo. In most cases, Kondo’s work is instantly recognizable for it’s cheerful spirit that has since become a distinctive feature of Nintendo’s in-house games. However, this is not the case with Majora’s Mask. There’s an ominous air of unease and sadness covering most of the score, something Kondo hadn’t had the chance to explore in his earlier works for Nintendo. The Title Screen music starts off gently with a calm variation of The Clock Town Theme, giving the player a gentle and relaxed introduction. Towards the end, however, the mood begins to change entirely. The playful Clocktown Theme makes way for Majora’s Theme, a foreboding melody that will haunt the player throughout the adventure. Majora’s Theme is the cornerstone of the soundtrack. The musical themes for the four locations Link must travel to, which are all doomed to destruction because of the mask, are all derived from Majora’s Theme. These compositions build an air of desperation and dread over Termina. 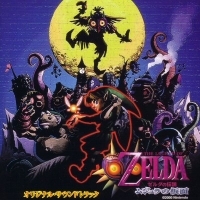 The score contains countless reworks of the theme, most commonly heard when encountering Skull Kid, the poor little imp who has become trapped by the evil mask. While Majora’s Theme may be a prime example of how far Kondo has drifted away from his trademarked cheerfulness, the soundtrack does contain a couple of really jolly tracks. While they bring a much needed contrast to the gloomy melodies of the game, they sometimes work only to enhance the strange and sometimes frightening atmosphere. One such case is the Music Box House in Ikana Valley. The music playing in Ikana Valley has to be the most scary and discomforting piece of the entire score, let alone any zelda soundtrack. It fits a location filled with zombies and haunted monuments of ancient civilizations perfectly. Surprisingly, right in the middle of the valley is the Music Box House, which will begin to play a happy, circus-like tune, once activated. Inside the house is a daughter who has locked her soon-to-become-a-zombie-father in a closet and is shivering helplessly in the corner. She is too scared to even let Link inside the house. This horrid scene is accompanied by one of the most joyous melodies of the game, a song that is supposed to drive the zombies away from the house. While the song is really cheerful, it seems so unfit for it’s location that it actually creates an air of fright instead of comfort, which only goes to show just how unusual and clever the sound design of the game really is. Some of the music heard on the soundtrack is borrowed directly from Ocarina of Time, these are mainly unimportant songs that play inside houses, shops and minigames, though some songs have been borrowed for such key locations as Romani Ranch and Goron Shrine. The more fascinating musical connections are the tunes the Zora band plays when they practice for their big number. We can hear Tijo the drummer playing the Cave Theme from A Link to the Past, Japas the bass player playing the Underworld Theme from original The Legend of Zelda and Evan playing The Ending Theme of the same game on his piano. The Temple Themes of Majora’s Mask are simply astounding. Woodfall Temple’s catchy percussion lines and eerie screeches take us inside of a strange ancient temple, overrun by the surrounding wilderness. The music is at the same time enjoyable to listen to and works like a charm for its location. The ambient melodies and sound patterns of The Snowhead Temple, start off with a very cold and uninviting soundeffects. The only recognizable instrument is a piano that suddenly surprises the listener every now and then with short and simple note patterns. We can also hear a ghostly choir singing a note or two every once in a while. Overall the the effect is exactly that, which it is supposed to be: cold. Taking a new direction from the first two Temple Themes, or Kondo’s other work for that matter, the theme of the Great Bay Temple takes a notable step towards purely electronic music. In his previous work Kondo has always imitated traditional instruments and the type of music that is usually associated with them. The Great Bay Temple’s repetitive rhythm and percussion sequences along with unusual looping sound effects are closer to contemporary alternative electronic music than any other musical genre, making it an exceptional track for any Zelda soundtrack as well as a very interesting piece from Kondo. He didn’t return to this style until the release of Twilight Princess six years later. While the above mentioned temple themes are all wonderful pieces of music, they are no match for the two ingenious compositions heard in The Stone Tower Temple, which is the only dungeon in any Zelda to have two separate background melodies. The player has to turn the entire temple upside down in order to access certain areas and eventually complete all the puzzles. Once the temple is flipped over, the music starts playing very differently yet keeping true to the original melody. We hear some inverted wind and a strange sound flickering from the left channel to the right and back. The result is an unsurpassed piece of Zelda music that remains as a strong fan favorite after all these years. The song even won second place in ZI’s Top Ten Zelda Scores. Another noteworthy detail about the score is the guest composer Toru Minegishi who makes an essential contribution to the soundtrack in the form of three tracks. These tracks are the battle themes of the game. The Battle Theme follows the clever design that was first introduced in Ocarina of Time: the music slowly builds up, starting as a simple percussion piece suitable for smaller enemies that are quickly defeated and building into a full blown battle track if the enemy takes longer to defeat. Since then Minegishi has contributed more music to the series by composing several tracks to The Wind Waker and Twilight Princess. After Kondo he has produced most music for the series. The CD release of the soundtrack does the score far more justice than the CD soundtrack of Ocarina of Time. Majora’s Mask is complimented with two discs and a booklet featuring official art and notes to the songs Link plays on the Ocarina during he game. The soundtrack to Ocarina of Time saw a pitiful attempt to cram the entire score to a single disc causing many of the songs to be shortened and none of them played over more than once. Majora’s Mask fixes most of it’s predecessors issues with the second disc allowing all of the 112 songs to fit on the album. The soundtrack is a must for any serious Zelda fan or video game music enthusiast. The soundtrack stands out, whether you compare it to Zelda soundtracks or other video game soundtracks in general. It was groundbreaking at the time of its release and continues to impress a decade later. There can be no better way to end this article than with the winner of ZI’s Top Ten Zelda Scores: The Song of Healing from Majora’s Mask.